Costco Sells 27-Pound Tubs of Mac & Cheese, so Maybe Never Cook Again? Cooking at home is more of a chore than most are willing to admit. People stake their entire status as adults on this habit, while others consider those who cook at home suckers. And honestly, those lazy, shiftless haters have a point. You really don't have to cook if you don't want to. Anyone who's ever going to remotely consider dating you will judge you, but we won't. The simplest way to never cook again is to purchase this massive tub of macaroni from Costco. How big is massive? 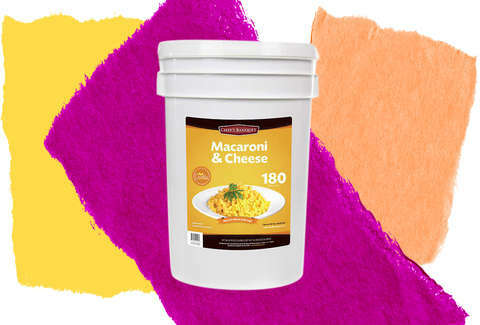 Behold: It's a 27-pound bucket of macaroni & cheese that holds 180 servings of the stuff, with a 20-year shelf life. (That last perk makes this a pretty good thing to keep in your basement as apocalypse preparation.) Note, however, that the mac and the cheese are packaged separately. You can't crack this thing open, throw dignity to the wind, and start shoveling it in cold. But that's probably for the best. Delish brought this product to the public's attention, noting that it's been around for years, yet no one told you. So maybe call your dad and yell at him? The site also points out that you can get this monstrosity delivered within a week and, at $89.99, comes out to around $2 per serving. In short, you can't afford not to buy this 27-pound bucket of mac & cheese.